A Snuggybaby sling for you and dolly too! When my second daughter arrived, all my first-born wanted was to be like me. How I wish I’d found this marvellous carrier then! Snuggybaby is such a great idea – you have a sling for your baby so get one for your older child to carry their own baby or favourite toy. Life will be so much easier now there’s no more dragging soft toys through the dirt – genius! 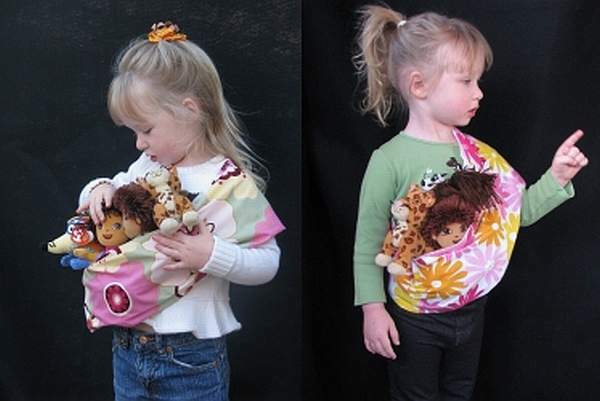 Mini slings are made as a pouch so they’re easy for little ones to put on. There are twenty-two different designs to choose from, including camouflage, so it’s not all for the girls! And if you haven’t yet found the right carrier for you, check out Snuggybaby’s fantastic range of ring slings and baby wraps for real babies. They even have matching baby and doll sets! Doll slings are US$11 and baby slings are US$45. Shipping to Australia available.